Biodiversity within an ecosystem has mutualistic and symbiotic relationships within that environment. The results of deforestation can be dramatic to these relationships, especially in cases with frugivores. The relationships between frugivores and fallen fruit are what help disperse seeds across the forest floor, which also helps the process of germination. In this study, Bieber et al. (2014) analyzed the mutualistic interactions between ants and fallen fruit in São Paulo State, SE Brazil. The scientists were examining the difference in interactions between disturbed and undisturbed forests. They compared the richness of ants at each fruit, species density per station, frequency of specific ant groups, frequency of fruit and pulp removal, and distance of fruit removal. The study was conducted using four disturbed forests, and four undisturbed forest areas. In these areas, there were thirty sampling stations with synthetic fruit placed 10 m apart from each other to ensure independent discoveries. The fruit were placed on a white sheet of paper within a wire cage to ensure that vertebrates did not access the fruit at each sampling station. The synthetic fruit are used in order to have a sufficient number for experimentation; these are similar to real fallen fruit because of its lipid-rich pulp for which ants show a high preference. The ants were tabulated by species type and were collected after 5 individuals visited the fruit at specific times of day. The researchers stopped recording at a fruit after it was 75% of its pulp was gone, or after 22 hours of exposure. The scientists found a total of 51 ant species attracted to the synthetic fruit, with ant richness ranging from 16 to 24 species per forest site. However, species richness was different between undisturbed and disturbed forest areas. They found, in general, that fragmented forests have lower overall species richness. 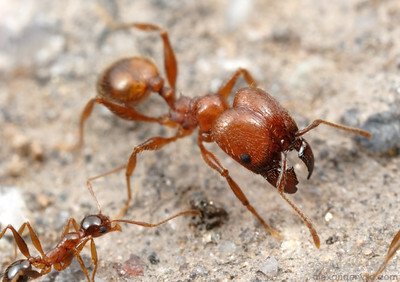 They also found that large ponerine, Pheidole and Solenopsis, had the greatest number of species in both habitat types, while the species Pachycondyla striata, Odontomachus chelifer, and Pheidole were the most frequent removers of the lipid-rich pulp. The authors observed that the large ponerines and large Pheidole were most likely to disperse the seeds, meaning this particular species is integral in maintaining this mutualistic relationship. They also discovered that ants found the fruit faster in undisturbed sites than in disturbed ones, leading to greater fruit removal at the undisturbed sites, although fruit removal was more variable in disturbed forests. The number completely cleaned fruit did not differ between the two forest sites. These results suggest there is a negative impact on ant-fruit interaction as a result of deforestation. Overall, undisturbed forests had denser species richness and assemblage of ant species interacting with the synthetic fruit than did fragmented forests. Undisturbed areas exhibited a much higher rate of ants finding the fruit in general, although ants still found the fruit in disturbed forests but not as quickly as they were found at undisturbed sites. This suggests that the fallen fruit in disturbed areas are less likely to be dispersed or germinate because there is a smaller likelihood of large ant species attending to them. There was also a significant difference in ant species composition between the two forest types, which is consistent with previous findings that point to lower species density in fragmented forests than in untouched forests. This entry was posted in Behavioral Response, Biodiversity, Maithili Joshi and tagged Ana Gabriela D. Bieber, Ants, Brazil, Experiment, Field Study, fragmentation, Paolo S. Oliveira, Paulo S. D. Silva, Sebastián F Sendoya, Synthetic Fruit, Trees by Emil Morhardt. Bookmark the permalink.